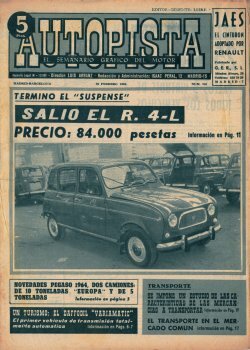 The berline version, '4L', is introduced in Spain in february 1964. It is built in Valladolid. 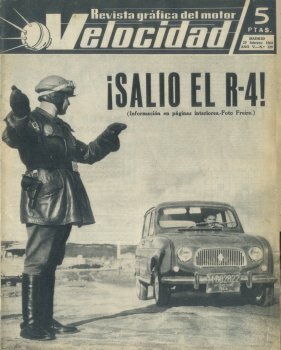 Although referred to as R1123, the Spanish introduction model is rather different from the French 1964 model. 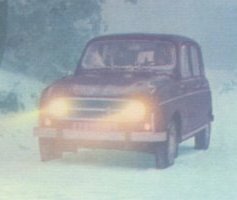 Among many differences the most striking ones are the bumpers (parachoques) and the enjoliveur de plaque (bigote) along the rear license plate (in France mounted only on the 1962 Super and the 1964-1968 Parisiennes). 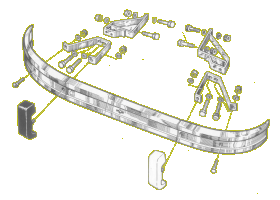 Tripod wheelcaps are shown only on some of the brochure photos and not in the magazines (shown below), but anyhow present in PR785. Furthermore, the car has an 845cc Billancourt Ventoux engine and a 12V electric system. The rearview mirror is attached to the roof. On the dashboard (salpicadero) an arrow shaped logo is fixed. 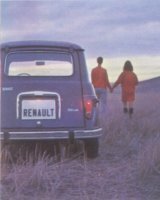 The release of the new Renault is announced in the magazines Autopista 266 and Velocidad 129. Note the flags also used in other countries for the Prenez le Volant action, and the sticker on the right door. 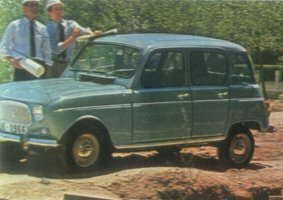 In november 1964 the Super (R1123S) is added as deluxe model. It is announced in Autopista 296 of September. 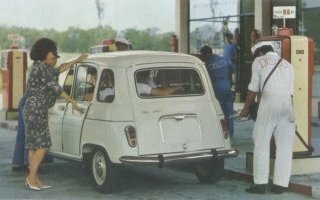 It has nothing to do with the French Super of 1962-1964 with its double bumpers and downward opening hatch - this Super would last until 1975. 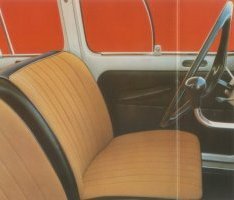 The major differences with the Spanish 4L are the luxurious seats of the former, as well as the 'Super' logo on the dashboard, on the left front wing and the hatch. 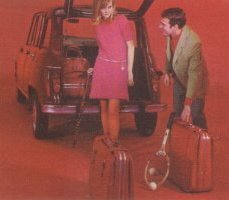 In 1966, even the Parisienne is listed in the brochure, although it remains uncertain if this model was actually sold in Spain. In 1967, the bumpers of the R8 replace the old ones. 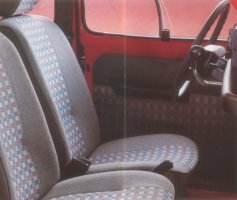 In 1968, a completely restyled version is introduced, as is also the case in France and other countries. 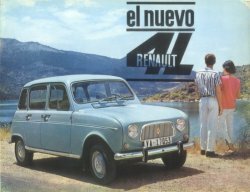 The brochure proudly names it un nuevo coche (a new car). 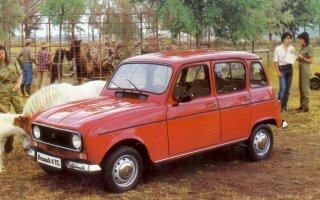 The Spanish model is named R1125, in contrast to France, where the 1968 model is still referred to as R1123 (and later R1126). It carries the aluminium grille (calandra or parilla) encompassing the headlights. The bumpers (parachoques are (still) the same ones as mounted on the R8. The engine is the 852cc Sierra or Cl&eaigu;on-Fonte (35hp @5200rpm, later 32hp @5000rpm), with 4 gears. The second dashboard is mounted, in beige. 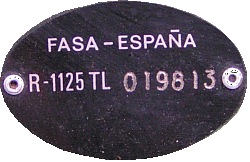 The logos on the hatch are 'RENAULT' and 'FASA ESPAÑA' (until 1972). 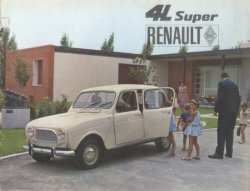 From 1968 onwards, also a basic version with the first grille, dashboard and steering wheel, without wheelcaps or lower side strips (underneath doors) is available, in the first year even with the old 845cc Billancourt Ventoux engine; the deluxe version is then referred to as Super (R1125S). The Super loses its Super logo on the hatch; it is now only on the front left wing. 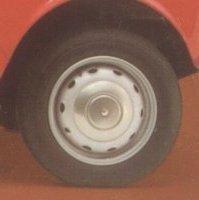 In 1974 the rims of the R6, with ventilation holes, are mounted. 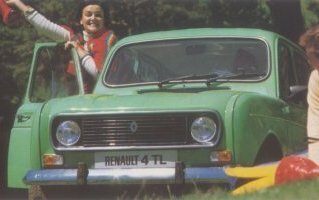 In 1976 the TL (R1125TL) replaces the Super. 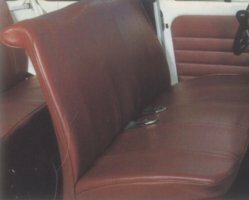 The TL carries most of the characteristics of the 1975 Super, such as the bumpers, the bigote, the armrests etc. 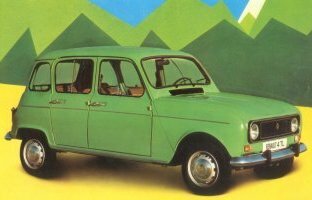 It carries the black plastic grille that was introduced in France in 1975. It has the same Sierra engine as the Super. 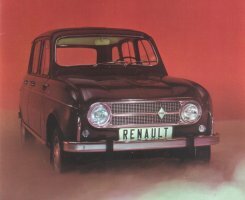 In 1978, the R1125 is restyled again, in a way that has even more impact than the introduction of the plastic grille in 1975. 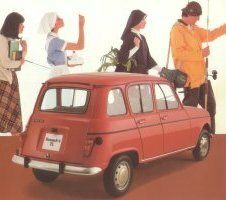 The bumpers are changed for the French 1968 model. 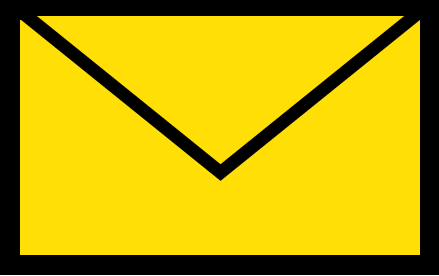 The front indicator lights (intermitentes) become rectangular orange/white. The metal air inlet (rejilla de entrada de aire) under the windscreen becomes plastic. 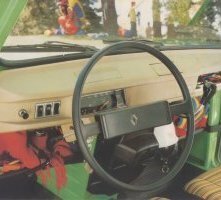 The steering wheel is that of the R5. 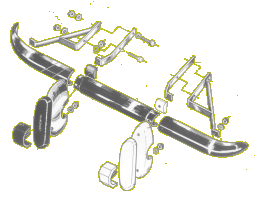 On the other hand, there still remain typical details like the dashboard (beige), chrome parts like hatch closure, door handles and wheel caps, the 852cc Sierra engine and the rear light reflector surrounded by an aluminium strip. 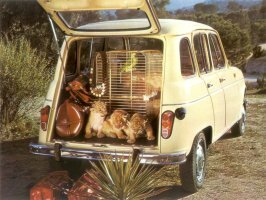 Until 1981, all brochures list a basic model and the TL; after that, the only model is the TL (equipped with the 1108cc Cl&eaigu; engine), until 1989. The GTL was, wisely, never produced by FASA. 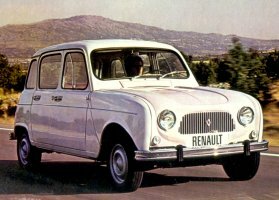 In subsequent years, the look of the R1125 becomes more and more French, like for instance by the introduction of the 1108cc engine (1982), and the third dashboard (in black, 1983). Nevertheless an R1125 is always easily distinguished from its French contemporaries by its combination of the chrome parts that are now becoming rare or absent on French models (bumpers, hatch closure, strips below the doors) and the black plastic strips replacing the aluminium baguettes (embellecedores, in 1982), until the very end of production in Valladolid in 1989. After 1989, the Clan will be imported from Slovenia.